… whether the strings needed changing or not! What? How is that possible? Am I crazy? Seriously, I just changed the strings on 3 of my guitars. The strings on my Martin acoustic guitar hadn’t been changed in 9 years. The strings on my Epiphone Casino hadn’t been changed in over 8 years. The third guitar, a parlor sized acoustic had had a new set of strings put on only 9 months ago. Let me explain. The Martin and Epiphone but still sounded good. I use 3 criteria when judging whether strings need changing. The first is whether the intonation is still good. When guitar strings get too dirty and too damaged, too corroded or rusty, you can often tell by testing 12th fret harmonics. The harmonic and the open string note should sound to be the same note. You can test this with a good chromatic tuner if you can’t hear it — but you probably can hear it if you listen. The second is simply do the strings still sound alive. If they’ve gone dull and no longer have the clarity or tone you are looking for, then it’s time to change your strings. The last is simply are the strings “gunky”, dirty, slimy or otherwise disgusting. The Martin and Epiphone passed the first two tests even though the strings sets had been on those guitars for over 8 years. The parlor guitar failed even though those strings had only been on the guitar for 9 months. The results were reversed for the last criteria on the three guitars. Martin and Epiphone strings were gunky while the parlor guitar strings were still clean. 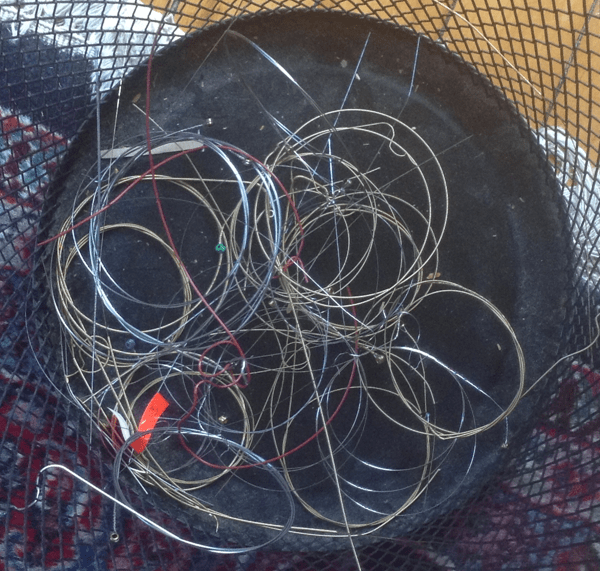 What explains these extraordinary results for my guitar string’s lifespan? The Martin acoustic had D’Addario EXP coated string (EXP 11 80/20 Bronze, 0.012 – 0.053 inch diameters). I love the EXP coated strings. I’ve been using them most of my acoustic guitars for over 12 years. I don’t usually leave them on the guitar for 9 years (until now) but I have often kept them on for a year or two. The coating really prevents corrosion and other problems. They strings really last a very long time. But the strings did show signs of damage and gunk when I finally changed them. The Casino had flat wound strings. I love flat wound strings on my electric guitars and now that I’ve sold four of my electric guitars, I no longer have any electrics strung with round wound strings. Flat wound strings have two things going for them that makes them last a long time. First, they are flat. That means there aren’t crevices where dirt, sweat, moisture and oils can accumulate. That goes a long way towards keeping the strings clean and fresh. The second thing is flat wound strings are corrosion resistant. They are stainless or chromed steel and don’t rust or otherwise degrade the way other steel can. The strings on the parlor guitar could be thought of as an experiment from the other direction. I had used EXP11’s on this guitar on the past but I was experimenting and tried a set of Ernie Ball Earthwood 80/20 Bronze Silk and Steel strings. It had been maybe 40 years or more since I had tried silk and steel strings. It was an impulse. I didn’t like it. But the important thing from the perspective of string life was these strings did not last 9 months. The last time I had EXP strings on this guitar they lasted more than a year. There are many more brands and types of coated strings available now than when I first started experimenting with coated acoustic strings. 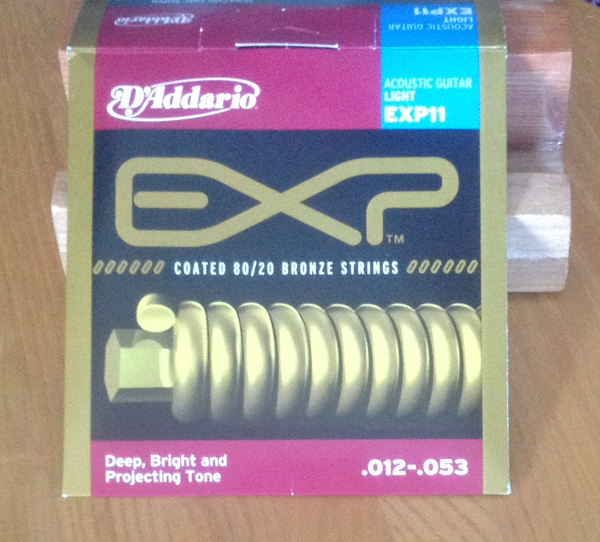 I stopped looking when I found the EXP strings from D’Addario. They sound and feel like the same strings uncoated but they last a truly long time. There are now EXP electric strings and other companies have other types of coated round wound electric strings. I had tried enameled strings from DR on a Danelectro I sold last year. I wasn’t impressed. I can’t comment on the EXP electrics since I only use flat wounds on my remaining electric guitars. Flat wounds aren’t for everyone. They’ve been used by jazz guitarists, rockabilly guitarists and some British invasion and country guitarists but they don’t produce the bright sound most young guitarists are looking for. Still, if you haven’t tried flat wounds and especially if you have a hollow body electric, you might want to try your own experiment. Unbelievable website. So much great information. Thank you!